I often wonder what the obsession is with everyone and their retractable dog leash, also known as a flexi leash. Actually, I do know what it is I just can’t understand why users don’t see the downsides, especially when they’re so obvious! As far as I’m concerned, in too many cases they are an accident waiting to happen. 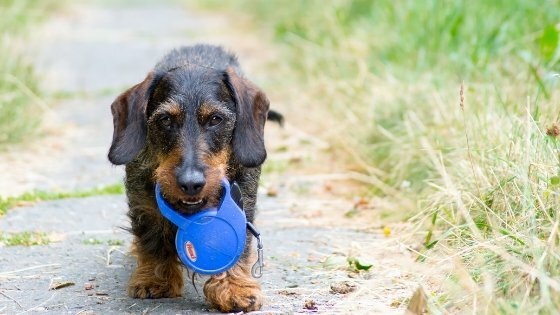 What is a flexi leash for a dog? If you’re a new dog parent or just aren’t familiar with this device, it is a long thin cord with a clip at one end that hooks onto your dog’s collar, with a spring loaded device in a plastic casing that also forms the handle. There is a button on the casing that controls how long the cord can be extended. The further away from you your dog goes, the more the cord will extend, when he gets closer to you, the cord will spring back into its’ casing. The button can also be locked in place to keep the length constant. There are various sizes of flexi leashes to accommodate any dog, which affects the size of the casing and the width and sturdiness of the cord. Some can extend up to 26′! Why do so many dog parents use one? It prevents/reduces the chances of their untrained dog yanking the walker’s arm out of its’ socket, because they pull too much on a regular leash. It gives their dog freedom to walk and explore wherever they want, yet not as free as off leash so they’re safer. Do I use a flexi leash? 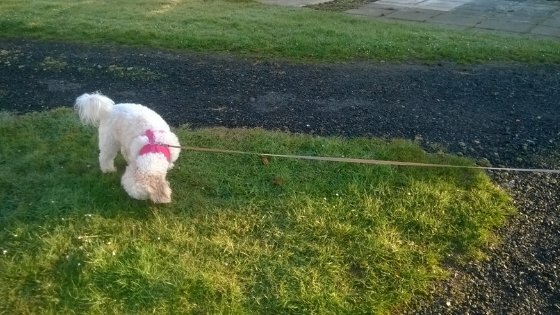 Given all the reasons you’ll soon learn why I think a flexi leash for a dog is a bad idea, you may be surprised to learn I have used one for many years but let me explain. I foster and adopt small old dogs with health issues. None of them are going anywhere too quickly, so a flexi leash is the perfect way to take them for walks in quiet areas and give them some freedom. Notice even though they’re old I still only use this type of leash where it’s quiet! 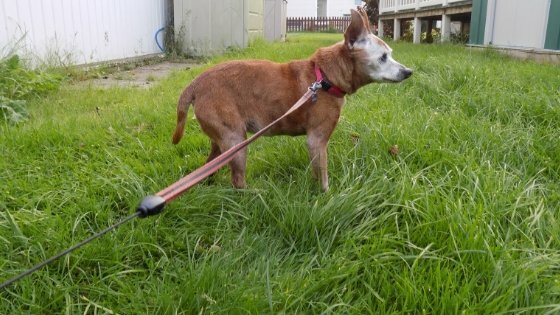 When we first adopted Red, the love of my life who sadly gained her wings almost a year ago, I used a standard 4’ or 5’ nylon leash. She was blind and walked very slowly and it worked for us, but when we adopted another dog who walked even slower than she did, I found she would be pulling against the leash. Although it was just a gentle tug, I wasn’t willing to take any chances of her injuring her neck so I bought a flexi leash. It made walk time much more pleasant for everyone. That’s her in the picture above! I stayed with the flexi leash even after my other dog died because Red got used to it and it worked really well for us. In busier areas she always wore a harness with my 4’ or 5’ leash, or we used her pet stroller to be extra safe. I keep him on my left while on walks, no running in front or side to side, and a regular leash allows me to do that. I wrap the excess around my hand, and unravel it when he needs more room to sniff! Coming from an abusive background he does react at times when out walking. Although he’s 1000 times better than he was and doing incredibly well, there are some dogs he gets scared or nervous around, so keeping him walking nicely by my side is safest for everyone. I want to create as many scenarios as possible that will set him up for success, not failure. Living so close to the beach and a massive park means I see tons of dogs and their humans every day, and that means a lot of people struggling with retractable dog leashes. I have seen too many dogs try, with some succeeding, to get into the road or go after another dog, and the person at the end of that leash is grabbing onto the cord, trying to control them. That is bad on so many levels. First of all, have you ever tried to grab the cord? Ever heard of rope burns? Never mind the fact that when your dog is lunging or running off the sidewalk into the road from 10’, 16’ or even 26’ in front of you, you have no hope, only luck, of preventing a tragedy. A few months ago I was watching a man with a flexi leash running like a lunatic to keep up with his dog, who was so far ahead of him there was no more cord left. When we chatted later, he tried to convince me he was running with his dog. First of all I didn’t need convincing, but that was so far from “going for a run” and more like a man who never trained his dog, trying to keep up. He did admit he hadn’t done any training, didn’t see the need, so my kind offer to help (I’m a trainer) was declined. Many years ago, an older woman I knew was taking care of her friend’s puppy. The leash was extended quite a bit because the puppy was busy exploring. The woman didn’t have her hand fully grasping the handle (your fingers need to be curled around it for added safety) and it dropped, retracted, smashed into the puppy’s head and killed her. It was such a tragic accident and I certainly didn’t write this to scare you, only to drive home the importance of keeping a firm grip on the handle. I’m sure your dog is well behaved, would never chase a squirrel or fox, loves every dog and child and has never run into the road to chase or say hi. What if something happens to change all that? 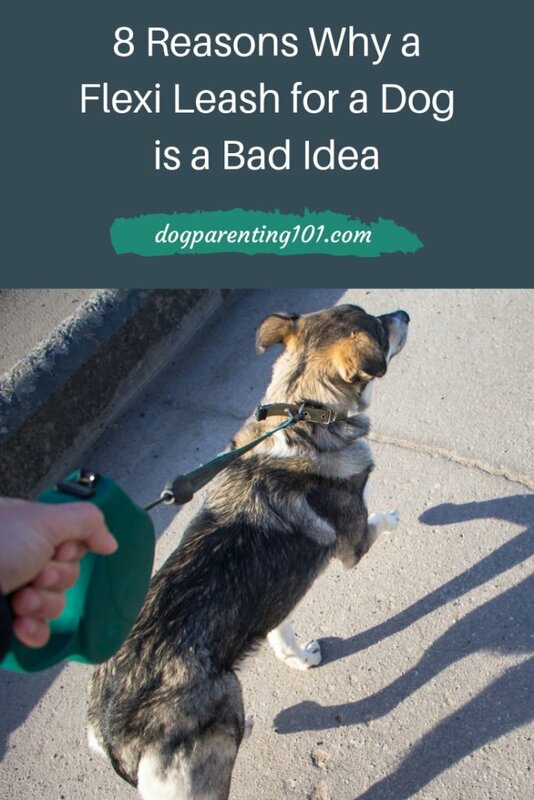 If that leash is extended and your pup is several feet ahead of you, do you honestly believe you have any control over your dog taking two steps to the side and ending up in front of a car? Impossible. You cannot yank a dog out of harm’s way quickly enough with a flexi leash that is extended even partially. A couple of weeks ago I was coming out of the park with Jack and saw this small dog being walked on a flexi leash. He was running back and forth from one side of the pavement to the other, sniffing this and that, crossing in front of and behind the woman walking him. I literally stopped, fascinated with watching her constantly switching the leash from one hand to the other. That would have driven me mad!! I wondered why that didn’t drive her crazy, especially given how many times she almost ended up flat on her face. You have no idea how well trained he is, if he goes after kids, bikes, cats, or how nicely he walks on a leash. Even if he or she came from a foster environment and was well trained, you cannot assume he will react the same way with you, and certainly not at the beginning in a new environment. If you adopted a puppy mill rescue, a harness and 4’ or 5’ leash on the harness is best, and if your dog is really nervous a second leash on the collar may be the safest option. When your untrained dog runs to chase a bird, whose arm is nearly ripped out of their socket, and how many times is it dropped when it’s pulled from your hand? You have a dog that hasn’t been leash trained. The pet parent didn’t think it was necessary because they have this wonderful retractable leash so off they go. Time passes, the dog gets bigger, stronger or just more unruly. Walking him becomes a bigger nightmare with each passing day, because every time you go out he’s pulling more and more. He’s bored out of his mind because he gets no physical exercise or mental stimulation, and he turns destructive. He chews through fences, digs holes in the yard, and terrorises neighbours and their children by trying to jump over, what should be, a too high fence. What happens next? He’s badly behaved inside the house and drives everyone crazy. People stop coming to visit because he’s impossible to be around, and when the family can’t take it anymore the dog is dropped off at the local shelter, where the chances are not good he will leave there alive. I have no doubt many of you reading this article will be shaking your head, thinking I’m being overly dramatic, or exaggerating. Well, I can assure you this is a very common occurrence, and yes, it is very sad. You’re walking down the road and bump into someone you know, so of course you’re going to have a bit of a catch up. How easy is it to get distracted and drop the leash! The handle can be quite big and it is difficult to keep a tight hold on it in the best of times. If you have a fearful dog like Jack can be, allowing it to extend in front of you isn’t safe for your dog or a dog or person walking towards you. Someone may suddenly appear from around a corner and your pup is too far ahead to reign him in. If a dog pulls long enough and hard enough, over time the leash can break and your dog will be loose. I speak from experience and thankfully nothing bad happened, but with a different dog there could have been a very sad outcome. I used to walk a lovely beagle who was left alone more hours than was fair because his humans worked very long hours. Okay I’m off my soapbox!! This dog obviously needed a lot of exercise, and being a beagle was always guided by his nose. He must have pulled long and hard on that leash over time because one day I was walking him and the cord just broke out of the handle. Luckily he didn’t take off and I was able to tie it so we could get home safely. It’s not you it’s them! All this time I’ve been focusing on what your dog could do, but how about someone else’s? Plenty of people don’t give much thought to training, and there are aggressive dogs out there (through no fault of the dog I might add! ), that are nasty encounters waiting to happen. If your dog is walking far ahead of you, how could you get your dog out of the way in time to avoid a potentially nasty confrontation? Is there a suitable time to use one? Absolutely. Walking an old dog with mobility issues in quiet areas or the park for example. A well-trained dog in a quiet area where you have a firm grip on the handle and are paying attention to what’s going on around you. A dog parent who is in tune with their dog and knows him well enough to see when things are about to change. 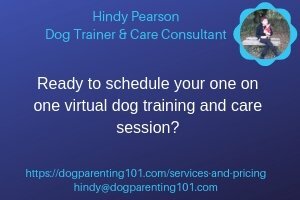 I know it seems like I was being tough, and perhaps that’s because I’m a dog trainer and care consultant and I’m always aware of what people are doing when out with their dogs. It’s not that I think one little device can wreak so much havoc, it’s just that I see a lot of unsafe situations every day and most people won’t realise it until they either have a close call or something unfortunate happens. Do you use a retractable dog leash? What do you love about it? Do you have any concerns about using one? Sharing helps others so please leave your comments below.